Frank Lampard believes Chelsea team-mate Daniel Sturridge is the man to fill the gap in the England team left by Wayne Rooney's suspension. Rooney has been told by England coach Fabio Capello he will not start another international until he has served his ban at the Euro 2012 finals. 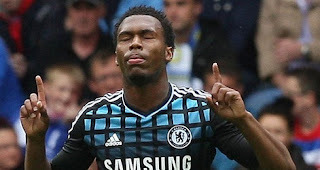 And Lampard believes that Sturridge could be the perfect replacement for the Manchester United striker - starting in next month's friendly with world champions Spain. "There is no doubt Daniel will break through at international level," Lampard said. "It's just a matter of when it happens for him. He can be a great player for Chelsea and for England. He has skill, unbelievable speed off the mark and he can finish. What more can you ask? He brings the excitement that supporters crave and his pace gives him the ability to beat his man and create a goal out of nothing."